Pre-gym is an extension of kinder-gym for 3-5 year olds, with the introduction of basic gymnastics body movements and skills. The program helps children to develop good co-ordination and confidence in physical movements. It is fun, enjoyable and non-competitive. 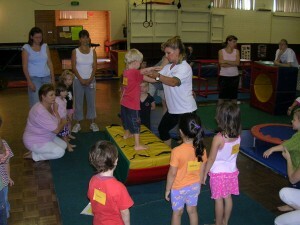 The session is conducted by a fully qualified accredited Level 1 Kinder-gym leader. Pre-gym operates in four terms, following the school terms. Sessions are 45 minutes per week. To provide a varied program of enjoyable, interesting and stimulating activities. To have fun whilst acquiring physical skills. To promote, develop and create a variety of movement experiences. To provide ideas for moving in different ways in space and on equipment. To stimulate imaginative movements, eg animal walks, which lead to more formalised ones, eg forward roll. To learn dominant movement patterns of statics, balance, spring and land, hand and swing, rotation and eye/hand co-ordination, plus other locomotor skills. To develop skills in listening, following directions, and remembering instructions and sequences of movement. To give experience of co-operating in a group, following others, and working with partners.